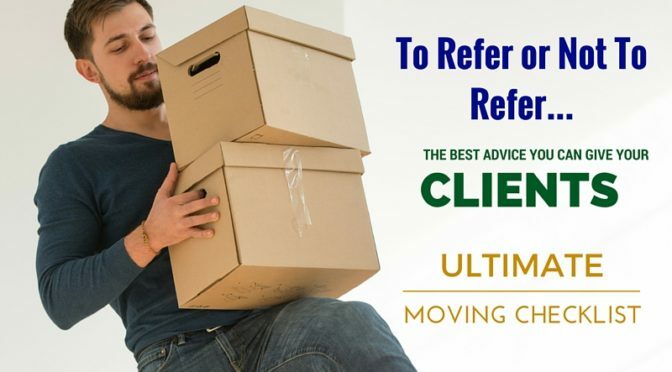 Referring a moving company these days – is actually pretty darn easy. 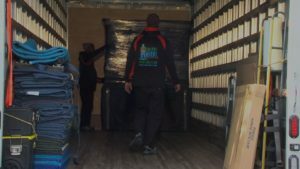 There are a few moving companies that have really set themselves apart form the mistrusted industry. Another bonus – their movers will actually sponsor an open house for your broker tour! 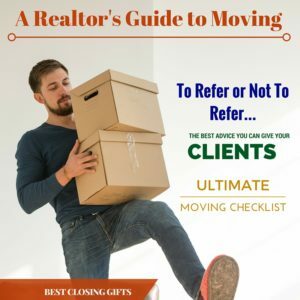 You can download a moving comparison sheet here – or send the link to your clients – it has all of the pertinent questions to ask your moving company. In the case of a bridge loan or new construction, your buyers may need overnight storage or short term storage. This is one of the most common moving needs – and storage is tricky. First off, pods are not recommended. After a few years, their reputation has taken a serious hit and the amount of people complaining about stolen items is too much to risk. I suggest finding a mover in your area who will let you keep your clients items on the truck overnight – it’s called on-board storage – a quick search moving overnight storage should give you a good list to start with. On-board storage should run about $100-$200/night in the peak months. 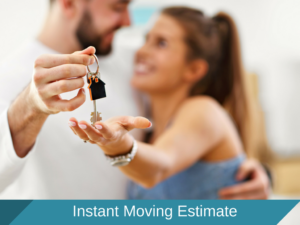 Short Term storage will require two separate moves as well as a monthly storage fee. It is very important to find movers that have clean, secure storage – you can always google map their location to take a closer look. This is your last chance to help your sellers out. The long distance moving industry is in the middle of a much needed overhaul. Long gone are the needs to wait up to 14 days for a van line to haul your customer’s belongings across the country. Private long distance movers are doing this much faster ( about 4 days MA to FL) and are even less expensive. How you ask? Private long distance movers don’t load/offload items into multiple storage units/trucks. They also don’t charge all of the typical van line fees like: fuel surcharge, mileage fee, taxes, tolls, fees for stairs, elevator and the biggest doozy – the shuttle fee. The shuttle fee is added if a larger 53 ft tractor trailer cannot access your storage facility/house/condo. Very common in Boston, New York City, Miami, Washington, DC and Los Angeles. 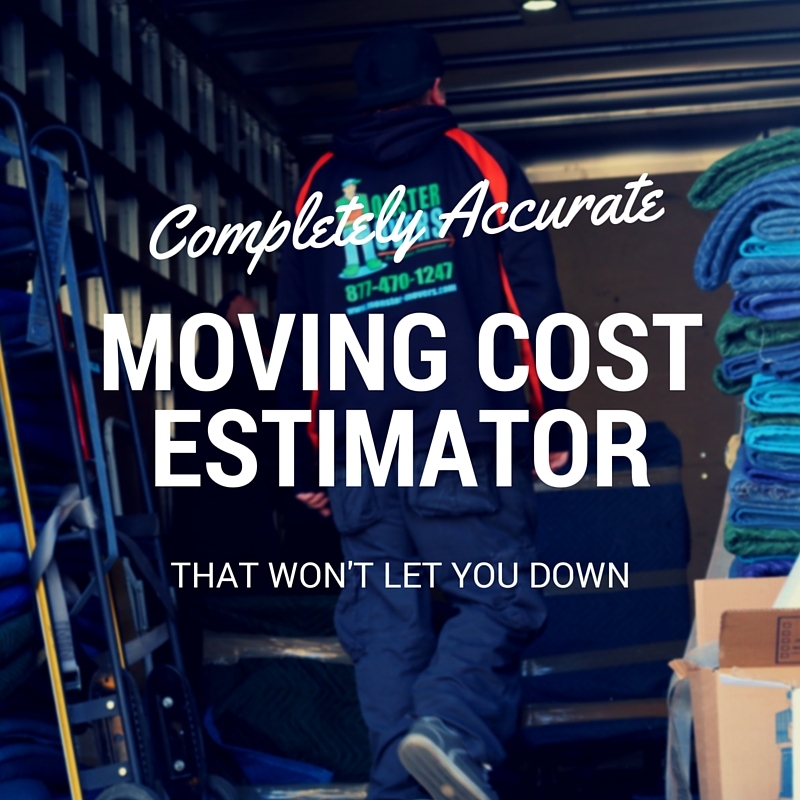 Here is a quick link to a quick yet accurate moving cost estimate form. You or your clients plug in the furniture they have and a vitally instant moving price is generated and sent to your email. This comes from a private company so your information is never shared or distributed. By now, if you have ever looked up moving checklists you will find thousands – maybe even millions. I think Martha Stewart alone has about 100 moving checklists. This moving checklist has everything your client will need – from who to call to what to pack. 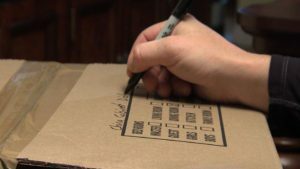 There are links as well to specific packing tips. The best closing gifts are always gift certificates and/or experiences in your client’s new town. And no, not to a home improvement store. Think dining experiences, massage envy, etc. Another gift that keeps on giving is a subscription to a wine club, craft beer of the month club, etc. This gift keeps your name and great service constantly coming up. Our all-time favorite moving fails – because who doesn’t love a good fail – especially on Friday the 13th. It’s hard not to get sentimental when you are moving – thinking of all of those things you will miss and opportunities gone by – your favorite coffee spot, that neighbor you never got to know to well but seemed cool, the nuances of your place only you know about. Okay – enough about that – YOU ARE MOVING! Adventure, learning new things, and hope for the unknown are right around the corner and we have the playlist for you – to get you in the mood to move! Move on Up is a perfect moving song for that last minute in your old residence – time to say good bye. There are a few options when moving cross country – you could move yourself, use a van line or a private residential mover. 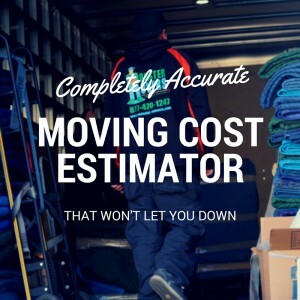 Depending on the time of year you are moving, where you are moving to and from and how much flexibility you have will also be key factors in finding the most cost effective way for you to move cross country. Labor: If you are hiring labor to help unload your truck – expect to pay $800-$1600 for the load plus the unload. Always opt for the full insurance on a rental truck. Rental truck operations are notorious for charging extreme rates due to any damage. Watch for low bridges on the way to your new residence – Boston, NYC, and even the back roads of Florida are full of low bridges. Stay off the Merritt Parkway in CT – half the time I am driving on that road I see a rental truck that attempted this low bridge road causing traffic. If you are staying in a hotel ask if they have truck parking – some hotels will not let your truck park there overnight. Rental trucks get pulled over just for being rental trucks. The DOT pulls them over all the time. Make sure your rental location has put the registration in the truck for you. If you have loaded your truck overweight – the DOT will shut you down and you will have to hire another mover/friend to get the weight legal. Expect heavy fines if this happens to you. Rental truck operations are not responsible for anything if your truck breaks down. FYI – if the truck looks old and scary I would ask for a newer one especially if you are moving cross country. 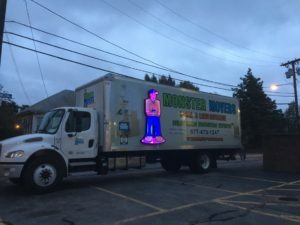 Rental truck agencies do not have any repercusions if your rental truck is unavailable on your moving day – I suggest leaving a few flex moving days just in case. Overall, moving cross country is not cheap – either way you will have to pay thousands of dollars to relocate. Monster Movers are private cross country movers that have transparent, affordable pricing for any cross country move.